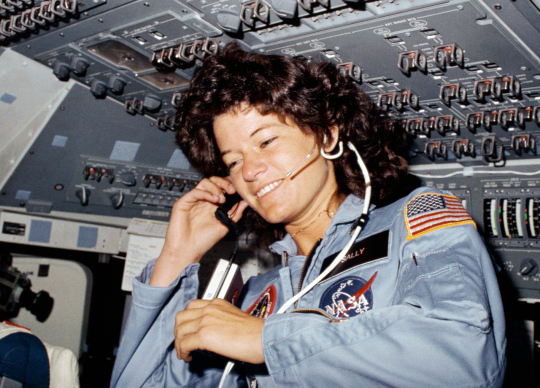 The surprise loss of Sally Ride has inspired numerous commentaries. Most thoughtful details on Ride–and on other women astronauts–are found on Athena’s blog. “Sally Kristen Ride, one of the iconic First Others in space flight, recently died at the relatively young age of 61: she was the first American woman to participate in missions. Her obituary revealed that she was also the first lesbian to do so. Like other iconic First Others (Mae Jemison comes to mind), Sally Ride was way overqualified – multiple degrees, better than her male peers along several axes – and she also left the astronaut program way before she needed to (more about this anon). Even so, Ride remained within the orbit of space exploration activities, including founding NASA’s Exploration Office. She was also part of the board that investigated the crashes of Challenger and Columbia; Ride was the only public figure to side with the whistleblowing engineer of Morton-Thiokol when he warned about the problems that would eventually destroy Challenger…” more here. Thank you for the link. Her loss hurt. She left a magnificent legacy. May we live up to it. I was glad to see the link too. It’s humbling to think of how little I knew about her, given how much she accomplished, and especially since I know someone who worked with her foundation. Hopefully she will continue to inspire everyone for generations to come.